Chappell, Paul, Dr. Very Good. 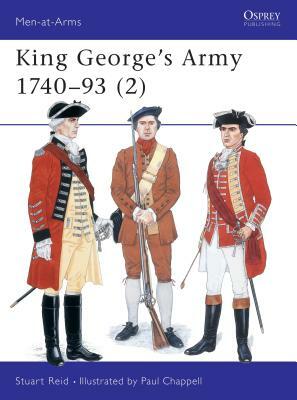 King George's Army, 1740-93, Vol. 2 (Men-at-Arms) by Stuart Reid, 1995-11-13. Trade paperback (US). Glued binding. 48 p. Contains: Illustrations. Men-At-Arms (Osprey), 289. Very Good+ 1855325640. Card covers have very light shelf wear present. ; A bright, solid book. ; Men-At-Arms Series; Vol. 289; B&W and Colour Illustrations, Maps; 9.76 X 7.17 X 0.24 inches; 48 pages; "The 18th century was marked by a steady growth in central control of the British Army and a corresponding decrease in the influence enjoyed by individual commanding officers. The most obvious sign of this process was the increasing uniformity of the clothing issued each year to the soldiers. Nevertheless, as far as those who devised the Clothing Regulations were concerned, it was a constant, and invariably quite uphill struggle to enforce compliance. This companion volume to Men-at-Arms 285 takes a further look at the infantry uniforms of the mid-18th century British Army, also covering the various auxiliary infantry formations, such as the Militia, Volunteers, Marines and the troops of the East India Company." Fine. Book. 8vo-over 7¾-9¾" tall. Softcover. Profusely illustrated in color and black and white. Clean, tight and unmarked. Very neat--a sound and handsome copy! Fair. 1855325640 Please allow 4-14 business days for Standard shipping, within the US. Thank you for supporting our small, family-owned business! Fine. 1855325640 Please allow 4-14 business days for Standard shipping, within the US. Thank you for supporting our small, family-owned business!